John Green is a hit and miss author for me. I mean, I love him as a person, and I really wish I could meet him IRL because he seems awesome. But his books are a different thing. Granted, he wrote "The Fault In Our Star", which is one of my favourite books of all time. I was never able to relate to another character as much as I related to Hazel. And I was 26 when I first read the book, so you can`t say that I was an impressionable teen. But then I read "Looking for Alaska", which I liked at first, but ended up disappointed with the further I thought about it. I tried to read "Paper Towns", but DNF`ed it after 60 pages. "Turtles All The Way Down" tells the story of Aza, a sixteen-year-old who struggles with severe anxiety and OCD. It`s an own voices novel and because of that, the representation of mental illness is extremely accurate. The story is told from Aza`s POV, and most of the time you feel like you`re stuck in a panic attack. It is a true portrayal of OCD and anxiety, and it will shed some light on these problems. A lot of the people on Goodreads were able to relate to the main character, which is always amazing. But for me, finishing this book was a chore. Maybe it`s because I`m extremely stressed at work or something else, but this book was giving me anxiety. I wasn`t enjoying it, and sometimes it felt like Aza was nothing more than her illness. I know that this book was meant to show how OCD was controlling her life, but for me, it was too much. Previous to this book, I have read only two books where the main character was struggling with OCD, "History Is All You Left Me" by Adam Silvera and "The Rest Of Us Just Live Here" by Patrick Ness. And I liked those characters better. I know that everyone`s experience is different and like I said, a lot of people connected with this story. But I just wished we got to see Aza in some of her good moments as well because she was stressing me out. I kinda hated her best friend Daisy until the point where she points out how difficult it is to be Aza`s friend. Like always, I did enjoy John Green`s writing. I don`t care what everyone else says, I love the fact that he writes over the top smart teenagers. It`s funny how a lot of people tell you not to patronize teenagers, that they`re creative and ambitious and they`re our bright future. But then those people complain about John Green`s teenagers and how they don`t know any real teenagers that act like that. Guess what? At 17, I liked to talk about philosophy and debate existentialism. And I`m sure a lot of teens are interested in other things than "Keeping Up With The Kardashians". Despite the fact that I did not enjoy this book a lot, I`d still recommend it to everyone. It might not be a fluffy read, but it`s an important book. Mental illness is something that affects more and more people, and we should take it seriously. And we should try to understand it. 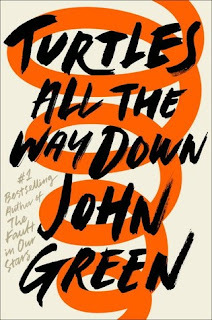 I haven't read this yet, but I have read and loved a lot of John Green books so I'm looking forward to finally being able to start this. It's a shame that you didn't enjoy this so much but good on you for still giving it a go! Great review! Thank you! I can definitely see a lot of people connecting with the story, but it sadly wasn`t my case. I'm with you, I was definitely a more mature teenager compared to some. Great review! I like John Green, but I was a little disappointed with this book. I wanted to see more of Aza than just her OCD. Same. I know OCD was controlling her life, but besides that she wasn`t a very developed character.